Fellow author and low-key my inspiration, J.M Williams nominated me to participate in the Writers Tag, started by Lorraine Ambers and Ari Meghlen (who have a knack for these things I won’t lie). Click on the names to visit their blogs and let’s work to continue both growing the writing community and expanding our circle of writers. Nominate 6+ deserving bloggers and notify your nominees by commenting on their blog. I have been trying to keep my personal life out of my “author” life as these feel like two separate entities encompassed in one body – and yet the same person. Not even close to the Trinity but the analogy works haha. Right, so let’s get into it. It was not a book that inspired me to write, but an old writing program called Storybook Weaver by MECC. I was in Grade 2 or 3 when we were taken to the computer lab to “learn” and I was using it craft my own stories. It was also here that I fell in love with computers and decided to study Information Technology (I.T). As for books, perhaps R.L Stine’s Goosebumps and K.A Applegate’s Animorphs? It could also be a Stephen King novel (Cujo? Carrie? Firestarter?) or Clive Barker’s “Books of Blood” or James Herbert’s “Once” as I progressed to harder horror at the tender age of twelve? It’s very hard to pin down but Storybook Weaver still stays with me always. Of course it’s horror. Everyone knows this. Although, over time, I have grown to love writing and reading Fantasy and Sci-Fi. I have no real preference. The story dictates where it will all lead and whether there should be a follow up, or leave it as it is. Initially I was a stand-alone writer, then I discovered I could also write short stories and novellas which could be put together into a series. Interestingly enough, I haven’t published a stand-alone novel yet, though I have tons in my drafts haha. Wow. No idea. I don’t think I’ve ever completed a MS… oh wait, in 2015 I actually won NaNoWriMo with my African-based fantasy novel Ngwana Wa Lesedi – The Child of Light. 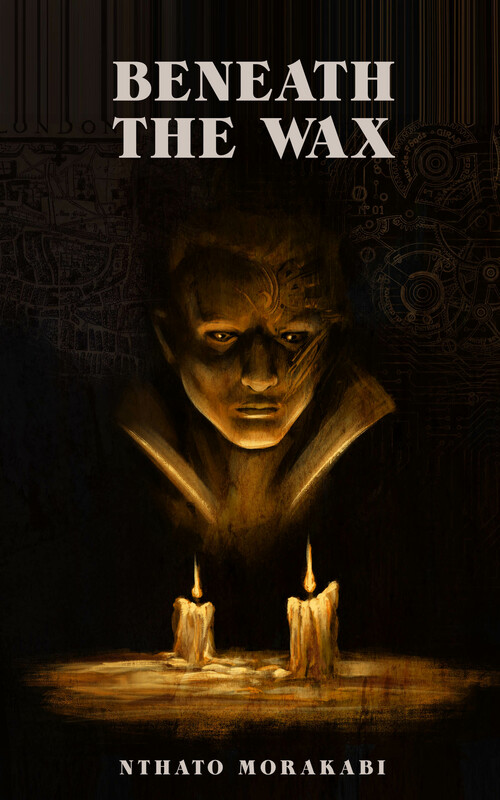 I also managed to knocked out the first draft of my upcoming novella Beneath the Wax in about a month. Have you read my blog? I should rename it to Stephen King Fan Account.wordpress. Haha, although I have idolized Clive Barker, H.G Wells, Frank Herbert, H.P. Lovecraft and a host of other authors. And just that little acknowledgement pushed me to carry on writing. It was also the growth of this blog once I started posting my short stories and people actually enjoyed them. That was how I got featured in my first Internationally published anthology Dark Tales, and told me perhaps I’m not such a terrible writer after all. I don’t think I have overcome it, and there are days (sometimes weeks) where it fully and wholly encompasses me. Just the idea of opening my word processor is enough to deter me from writing. And of course it’s the fear and irrational anxiety that I’ve wasted my time as a writer because I am not good enough that is the hardest part of writing for me. This blog, my friends both locally in South Africa and Internationally, as well as some of my own stories (surprisingly) have been imperative in pulling me out of that funk and getting me to get on with it. I doubt it will ever go away, but I hope it gets better. I used to be very active on Facebook and Twitter and Instagram. They aren’t my favourite but they are useful. I even tried to start a Bookstagram and linked all my blog posts to Tumblr. I just found that at the end of the day it was about statistics rather than about people enjoying my content – which you now know doesn’t help with the question above. A “Like” doesn’t mean they read what I posted, or any proof that they actually did like it. On occasion, I know I do the same, and I know many who do too. Now I will take the time to go through the content and if something resonates, I will take the time to comment. Find Yourself. Be Yourself. Live Freely. Right, now to tag some of my faves. Looking forward to reading all of your responses, and thank you for taking the time to have visited my blog (as many others have too). Posted in Writers Tag and tagged Blogging, writerstag, writing, writing community. Bookmark the permalink. From my experience watching and reading horror novels, grief always leaves an indelible impression on characters, even more so when those characters are parents, and deeper still when the grief is driven by the loss of a child. In some cases it is not the loss of a child physically but mentally, that old case where rearing children in a particular way leads the child to exhibiting unexpected behaviour. The “christian” parents whose child abandons the faith. The overprotective parents whose child rebels. And so on. Sadly, in most cases, it does not take a supernatural occurrence to drive the child into that state, but adding the hyperbole that is horror into the mix, we as the audience see the depths that grief can bring out in people. It’s not always extreme cases, such as the abuse Carrie White faces from her peers and mother in Carrie, or Alessa Gillespie’s abuse and eventual immolation in Silent Hill or the abusive history of Toshio Saeki in The Grudge. Still mourning the death of their son, Mark and Jessie Hobson welcome foster child Cody into their lives. Soon they discover he has a strange ability. The premise for this dark-fantasy horror film is quite simple. Cody has the ability to make his dreams come to life while he is asleep, and they vanish as soon as he wakes. Sadly he can’t control the ability, and as you can imagine, his nightmares are inevitable. Before I Wake carries less of a grisly/dark atmosphere prevalent in horror films. Initially it is much brighter, creating a false sense of security and augmented by Cody’s first dreams coming to life as beautiful blue butterflies, real as they are surreal. As the story progresses, so does the growing oppressive aura around the whole film, deepened at night when shadows loom around every corner, automatically drawing our eyes to them as we anticipate something lurking in the darkness. This digression is then shown when the butterflies become moths. Writing: Word choice is as important to creating this gloomy atmosphere as lighting and camera technique is to movies. Not every scene should be foreboding, but there will be elements that coalesce to paint an overarching mood/ambience. Word choice will hint at the unsaid, willing the reader to see more than you’ve told. Foreshadowing gives readers a glimpses of what is to or may come, increasing the sense of apprehension. Sub-plots that seem minor or circumstantial (The Cranker Man) can merge with the bigger picture to tell a much deeper, darker story. A few deaths necessary to the plot will help add to the reality of this horror. Before I Wake centers around a child’s known fear they can’t explain, made manifest by parents who downplay that fear. The character development of both Jessie and Cody, intertwine perfectly to bring this fear alive. Cody is aware that his nightmares coming to life could mean losing his parents both a) physically from the nightmare monster, and b) physically as his ability may scare them off and send him to another foster home. To a child’s mind, these are very real fears. You see how he attempts to overcome it in the choices he makes, such as reading books about butterflies to keep the nightmares away (among others), and drinking anything to keep himself awake. Writing: Writing about a fear is never easy. This is why character development plays an important role in creating that sense of unease and dread. Let the fear correlate with the characters. Cody’s main fear is the nightmare creature he calls “The Cranker Man” and later on in the movie we get the full story of where the name comes from and why he is so afraid of him. Ground the fear into the characters until its almost tangible enough that it manifests itself into an almost irrational terror. Cody forced to stay awake leads to an incident that literally haunts him later in the movie, solidifying his fear of both sleeping and The Cranker Man. Not all fears are rational, however, how you inject and show that fear in characters will make it more plausible and relatable. This helps you turn even the most irrational fear into a paranoid-fueled rational fear. The true horror is not in the fact that Cody’s nightmares come to life per se, but grief. Cody’s grief created The Cranker Man. Jessie Hobson’s indomitable grief drove her to use Cody’s abilities for herself. Her first child accidentally drowned in the bath so, as a recently grieving mother also suffering from deep-seated guilt, you can imagine the appeal of your new foster child bringing your dead child to life at the mere cost of sleeping. This obsession eventually blurs the line between being a good mom and being a grieving mother. Mark, Jessie’s husband, sees his wife’s digression and gets drawn in too at first. Sadly he does little to help comfort her, even when he realises just how far she’s been willing to go to use Cody’s abilities. Writing: In my opinion, writing horror shouldn’t only be about scares and gore and ghosts (among other things). Yes there’s a place for it, but looking at Before I Wake, there’s also delving into the human psyche. Put yourself in each character’s shoes and ask yourself how you would react in that situation. More importantly, why. Asking why helps build solid characters. Does the answer slowly grind away at the character’s sanity or belief to the point where logic and realism blur with the illogical and surreal. What are your character’s flaws? Test them severely. Usually in horrors, the characters end up making bad decisions. (Running up the stairs, going into the basement, playing that evil blues record they were told not to). The visible “Cranker Man” is not the villain of this film. He is actually a physical manifestation of Cody’s fear, interlinked with an event in his past and his own coping mechanism for that trauma. He is more Cody’s protector than some nightmare creature like Freddy Kruger would be. Cody himself is not the villain of this film. Sure it’s his nightmares and physically materialised creature that threatens those around him, but it’s really just how his young mind is trying to cope. Jessie herself is not the villain either, though her actions are selfish and put her herself, husband and Cody in danger. But as explained, she too is suffering and this is her way of coping, though in her eventual effort to finally solve the mystery of Cody’s dream, she helps bring closure to everyone. The real villain is actually something more real and not at all supernatural or otherwise. It’s a reality that affects many people in the real world, and this film is about how it affects those around people who fall victim to both its effect and high mortality rate. It was given a personification in Before I Wake, the hyperbole of horror, to show how devastating its effects would be. Spoiler – highlight to read it. “The Cranker Man” is Cody mispronouncing the word cancer, which is how his biological mother died, and the Cranker Man is the only way his young mind is able to grasp this unseen monster. This real killer. Writing: There’s a lot to pull out of this in terms of writing, and how it is the reason why the story, fear factor, character flaw, and final twist work so well together. This is because the horror is not a supernatural being, or some otherworldly creature that one can simply overcome by stabbing or shutting a door leading to the “beyond”. Nor is it a masked killer who is actually just human. It is the real horror of every day life for some people. Not every creature/entity has to be mythological or supernatural. Sometimes its something as simple as a virus e.g. zombie apocalypse. The story itself is not always about the creature/entity, but how those around it are coping with the reality of its existence. The entities add the suspense and action. E.g. The Mist by Stephen King. Not every horror ends in despondency. Sometimes there really is light at the end of the tunnel, and they live on past the darkness. Let me know if you’ve seen this film and your thoughts about it. If you’re a writer, horror or otherwise, was this helpful to you? Any way that it could be improved? Let me know in the comments below. Posted in Genre Writing and tagged amwriting, Before I Wake, film, Genre Writing, horror, writing advice, writing tips. Bookmark the permalink.